Visions of summer fun often include refreshing dips in the pool on hot days, but many people don’t have ready access to a pool or the budget for their own in ground pool. Once thought of as something you only settled for, an above ground pool may be your answer. 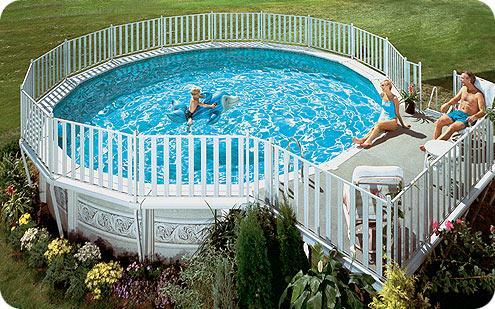 Models from 12 ft. in diameter to 18 ft. x 40 ft. are available at fractions of the cost of an in ground pool, and are much cheaper, easier, and faster to install. An above ground pool is cheaper to buy, and cheaper to maintain. Whereas an in ground pool will start between $15,000 and $20,000, you can purchase an above ground pool and all the necessary accessories for under $3,000. Maintenance will also be less expensive because the parts are more easily accessible, and any required replacements will be cheaper because above ground pools don’t require as high of caliber equipment as in ground pools. Additionally, above ground swimming pool pumps are typically smaller and usually use less energy. This translates into more money savings for you. Above ground pool installation is also much easier and faster. Digging and installing an in ground pool takes weeks or months; installing an above ground pool takes a couple of days at most. Whether you do it all yourself or hire a professional, there is no getting around the difference in speed with which the two pool types can be installed. Finally, an above ground pool may be a good idea for those with small, curious children or pets. A child or pet will not be able to wander into an above ground swimming pool as easily as they would be able to with an in ground swimming pool. Before deciding what type and size of above ground pool you will be purchasing and installing, start with evaluating the space you intend to set the pool, but remember, pools require a level surface and access to electricity and water. Begin by considering those factors, and then evaluate the areas in your yard that are candidates for the pool. In doing so, we recommend grabbing a measuring tape and some tool to mark your measurements – e.g. spray paint, chalk, colored sticks – and determining how much space you have for a pool. A note of caution: most pools require an extra three feet of clearance on each side to accommodate the supportive uprights. This means an 18’ wide pool requires 24’ of space. Zoning: check with your local department of buildings to determine what restrictions exist, if any, with respect to the placement or size of your pool. For example, many counties prohibit pools from being too close to the property line. Inspections: many areas of the country have ordinances that require homeowners to pay for an inspection when installing a new pool. In some townships these requirements even cover seasonal blow-up pools. Inspection costs vary, but expect to spend between $20 and $100 to pay for a pay for a local inspector to come out to their home and approve the installation. Proximity to Home: electricity and water are required, so avoid putting your pool in an area of your yard unreachable by one or both. Also consider ease of access – it will get used more and will be more convenient to maintain if it’s close to your home. Drainage: while some gradation of the ground during installation is inevitable, select a spot where rainwater naturally drains away from the pool. Trees/Brush: although natural shade may be desirable for some swimmers, consider the increased maintenance your pool will require if leaves and brush are hanging above and near your pool. Miscellaneous surroundings: ask yourself if you intend to build a deck or fence around the pool, and how that affects where you might set the pool. Also consider overhanging telephone lines, and things such as septic tanks or powerlines that might be buried underground. If you have any questions or want to talk through some of the issues you are thinking about with respect to selecting your pool and its location, call us toll free at 1.877.PCPOOLS (727.6657).